Everyone loves Minestrone Soup, right? Well, I love Minestrone Soup, but sometimes it’s just too hot for soup. It was one of those days when I started looking at my recipe box differently, and this is what I came up with. There are about ten thousand different ways you could make this salad and the variations are endless. You could probably add some grilled chicken or turkey to make this a meal, or you could add a jar of white beans, or double the veggies to beef up the fresh ingredients portion. Bring a pot of water to a boil and dump in the green beans and let them boil for a few minutes, when they are still bright green scoop them out and put them into a large bowl. Bring the water to a boil again and dump in the pasta, cook until al dente. While the pasta is cooking chop up the rest of the veggies and add to the green beans. Add the pasta, kidney beans, tomatoes, pesto and cheese. Whisk together the olive oil, lemon juice, garlic, salt, pepper, and mustard (or you could use Italian salad dressing if you are feeling frisky). 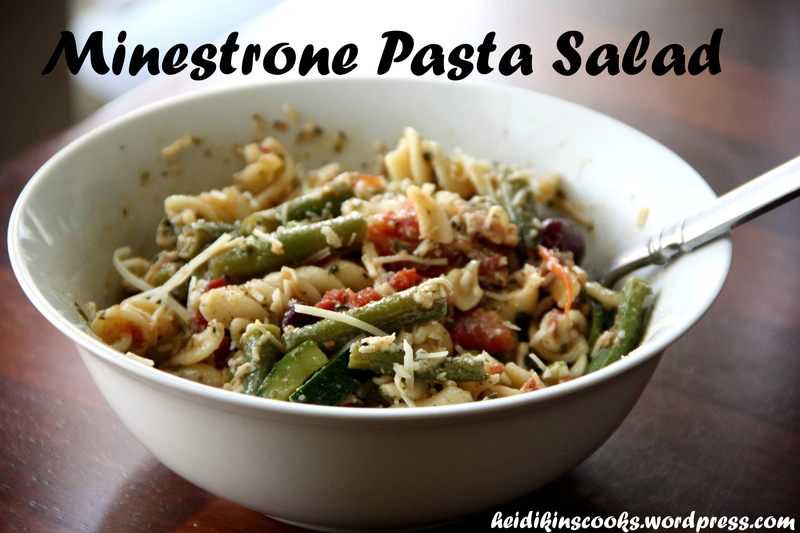 Drizzle on the pasta salad, stir, taste-test and add more salt or spices as necessary, and eat while still warm. This keeps beautifully, but it best at room temperature. I like to warm up my leftovers for 30 seconds in the microwave before eating because it brings out the flavor.